The Behemoth Bee Tree—solid as a rock. The bees are fine. The Village, as Deward called it, resting alongside Auld Fox Creek, at the bottom of several hills, at the junction of country roads, right where the pavement begins is much recovered from the frightful storms of the previous weeks. 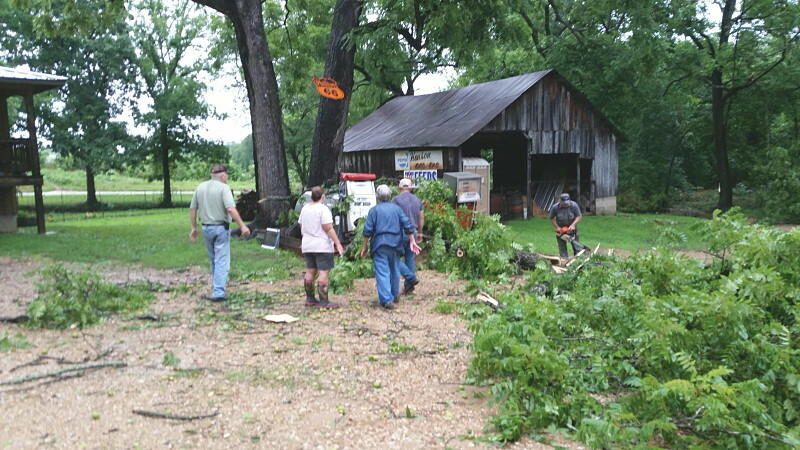 The brush has been hauled; the limbs cut and stacked, much of the damage to property repaired. 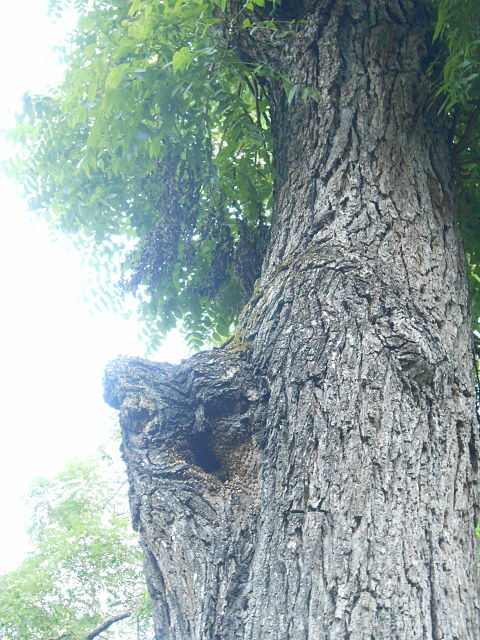 A prominent citizen spoke up to say that he had been entirely misquoted in The Champion News regarding the Behemoth Bee Tree. It was reported thusly: “A prominent citizen pointed out that the Behemoth Bee Tree stood like 35 foot tall pop-sickle stick, hardly ruffled in the breeze and the bees are fine.” What he actually said was, “The Behemoth Bee Tree stood solid as a rock!” The popsicle part was an embellishment meant to emphasize the relative lack of substance in the form of limbs, meaning no real wind resistance. There is one small limb broken with wilted foliage, but for the most part it is nicely leafed out and gives every indication that it will continue to live for a while. Champions hope the same for themselves. Champions abroad on the Isle of Bute off the west coast of Scotland describe their recent storm: “Not really night time with such a bright full moon and such warm air, alongside a suspicious lack of midges. Then black clouds closed over, pressing down on us, all the stars went out, and the night became too dark to be right. The air was still warm, but now it was moving. There was a noise like a rock fall, a landslide coming for us, then the low black heavens opened and the thunder exploded like the ground was splitting apart. Lightning bolts far too close, right over and around us, relentless, blinding, strobing cage bars. And warm torrential rain! Bliss. It lasted for an age, then moved off as one low slow alien ship entity, leaving the sky, the moon and the stars, leaving hairs bristling, and a smell of singed something. Last night was my favorite storm EVER.” Weather related excitement happens all around the world. Birthday excitement is happening for Seamus Heffern. He lives in Springfield and is a Champion Grandson. He will be 15 on the second of August (election day). His Grandmother says that his first priority is to learn to drive. “He will get his permit and then watch out.” Readers of The Champion News on line at www.championnews.us can go to the May 16, 2016 posting to see a good photograph of him as a finalist in the Physics Fair in Springfield. Pokey Man Go has his interest currently. He will be a man of his times. The first of August was the birthday of Elitta January who passed away in 2011. She was a long time resident of the area who raised her family here and who, over the years, touched many lives as a Hospice nurse. She loved bird watching, cooking, camping and gardening, and she loved to play Bridge. She will always be much missed and her friends speak of her often and smile remembering her own beaming grin. There will be an open house at Skyline School on August 15th from 5:30 to 7:00 in the evening. It will be a great chance to look around at the wonderful little facility and to become acquainted with the staff, a nice bunch of people. School starts on the17th. Open enrollment is August 8th and 9th from 8:00 a.m. to 3:00 p.m. New students are asked to bring proof of residence, shot records, birth certificate and Social Security number if possible. The Douglas County Health Department nurse, Nannette Hirsch, will be at the school on the 2nd from 8:30 to 10:00 a.m. doing blood pressure checks and other health screenings for the community. It is an important service that has proven to be lifesaving. The 2nd will also be a chance for the community to do a great service for the school, perhaps lifesaving, as the levy increase comes up on the ballot in the primary election. Property in the school district is assessed at 19% of the value for a residence, 12% for a farm and personal property at 33.3%. The increase of $.48 per $100.00 in assessed value will bring the total levy up to $3.43. This means that a homeowner with a $50,000 house and 2 cars worth a total of $15,000 would have taxes increased approximately $70.00 per year. What the levy increase will bring to Skyline School is an additional $44,000 from local revenue and an additional $20,600 from the State. These funds will go a long way toward updating the security of the school, the technology, the equipment—fixtures and furniture, as well as the transportation. It may be a surprise to some to know that the State requires Skyline to pay tuition for each of the students in our district when they enter the 9th grade in one of the three local high schools. Often the tuition is more than the State provides for each student. Skyline paid $205,000 this last year in tuition. Vanzant will be the high point of a multi-generational vacationing party of Idaho based Upshaws and Upshaw descendants during the coming week. They are sure to be at the Thursday Bluegrass Jam there and will swell the crowd by 17 or so. They have been touring the country, seeing the sites, including Mt. Rushmore. Perhaps they will circumambulate the Square in downtown Champion to examine the Behemoth Bee Tree and then lounge with refreshments on the spacious veranda to look out on another one of the world’s truly beautiful places—Champion! Looking on the Bright Side! Tranquility. (Okay, that is not a sentence. Rules of grammar can seem restricting, but overall English is a good language even if it seems a little awkward sometimes. Aunt Nellie’s daughter says it is a strange language, though through tough thorough thought it can be understood.) Tranquil. It is just the statement of conditions in Champion. The storms have passed. The brush is almost hauled. The soil is still moist. Sunshine has returned. Hay is being made. Cucumbers are overwhelming. Tomatoes are ripening. The creeks are cool. Family comes and goes and comes back again. Life is good in Champion. Over in Brushy Knob it is pretty much the same, except for the bears. Snagged from the internet the other day from Tarbutton Heights, “It’s been an exciting afternoon in Brushyknob. At least on our hill. We had another visit from a black bear about 3:00. He was walking around in the yard and then went over to the Apple tree and ate apples off the ground. He’d stand then sit and then lay down to eat them. I suppose we’ll have to be on alert now till the apples are gone. We have a few blackberries out back so I bet the ripe ones are gone now. That’s the direction he came from. Never a dull moment around here. I just happened to walk over to the sink and saw him out there. We stood on the upstairs deck and watched him for quite a while. Hope your afternoon was as exciting as ours.” Chances are pretty good that almost no one around these parts had such an exciting afternoon. The July issue of the Missouri Conservationist (mdc.mo.gov/conmag) has a great article, “Bear With Us” by Kristie Hilgedick. 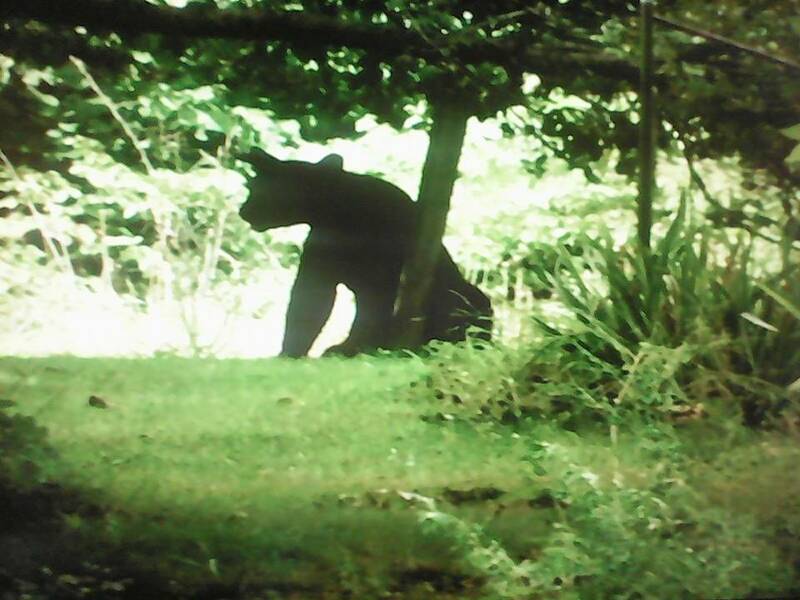 It provides a lot of good information including guidelines to “Be Bear Aware.” (Be loud. Do not turn your back. Do not run.) This monthly magazine is free to Missouri households and at a nominal cost to other areas. There is a great kid’s magazine that comes out six times a year. It is a Parents Choice Approved Award Winner. It is also free to Missouri residents and costs only $5.00 per year to send it to grandchildren who live far away. On July 18th, Tracee Davis said, “Happy 88th Birthday to my miracle mother, Inez Proctor Davis!” Tracee had lots of sweet things to say about the dear lady. Ethan Alexander and Zee Heffern (a Skyline alumnus) both have birthdays on July 19th. They do not live in Champion, but they have deep good connections here. The last ten days of July find a number of Skyline School teachers, staff and students with birthdays. Mr. Prock teaches 5th and 6th grade. His birthday is on the 20th. Mrs. Gunter teaches 4th grade and has a birthday on the 23rd. She shares the day with bus driver Ronny Trammel. Sixth grader, Grace Crawford, celebrates on the 25th, as does the cook, Ms. Dot. Jaci Borders is a second grade student who will be having a party on the 27th. Mrs. Sartor teaches kindergarten. Her birthday is on the 29th and kindergarten student, Eugene Elliot, has his birthday on the next day, the 30th. Apparently school will be starting up again soon–school supplies are showing up in the stores in town. Summer is the swiftest season. The August 2nd election will give residents of the Skyline R2 School district the opportunity to pass the levy that will raise the total up to the minimum amount required for matching funds from the State. There is a strong case to justify the need and the increase is a mere $0.48 per $100.00 assessed value. A Snickers Bar costs $0.99. An educated population is the hope of the Nation. This little rural school is a jewel—one of the last of its kind. SOS! Save our School! Little Champion grandchildren Carson and Drayson Cline are moving off to Tennessee. They plan to come back often to see their Champion grandmother. They will probably grow by the foot between visits, even if those visits are as close together as friends and family here hope. They were out playing in Clever Creek on Sunday. Next week they may be splashing in Cripple Creek. Where ever they are there will be fun and excitement, so look out Tennessee, here they come! These days are tranquil in Champion while the world all around seems to be in turmoil. Tragedy and strife is everywhere as 7.4 billion people try to exist on the same little planet. Political upheaval, regime change, old alliances broken, new ones forged, social unrest, civil disobedience and violence on every corner makes us fearful and anxious. Dionne Warwick’s song from 1967 still rings true, “What the world needs now is love sweet love. It’s the only thing that there’s just too little of. What the world needs now is love sweet love. No not just for some but for everyone.” If ever there was a time for tolerance, empathy and compassion, it is now. Each person feels as if he is justified in the belief that his prejudices are better than anyone else’s prejudices. The First Amendment to the Constitution guarantees freedom of speech and, while Champions applaud the right, they are willing to forego some of their person vitriol for the sake of harmony. Someone said, “Live without pretending, love without depending, listen without defending, speak without offending.” That is a tall order. On a Wednesday, or any day, come down to the wide, wild, wooly banks of Auld Fox Creek for an opportunity for civil discourse with convivial friends and neighbors. Buy some chicken feed or ice cream or any number of necessities from the broad, eclectic inventory. Get a look at the Champion Farmer’s Almanac posted on the bulletin board there. It says the 22nd and 23rd will be good days for transplanting, for setting strawberry plants and for planting root crops. 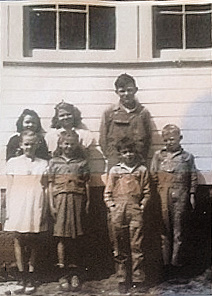 Find the almanac on line at www.championnews.us where there is also a picture of six students who had perfect attendance at the Champion School sometime in the early 20th Century. Sit out on the broad veranda and enjoy the scenic beauty looking across the Square to the Behemoth Bee Tree and the Little Church in the Wildwood. Soak in the mellow ambiance Champion—Looking on the Bright Side! At the Champion school you got a silver dollar for perfect attendance–fifty cents if you missed because the creeks were up. It was all chaos in Champion on Wednesday morning as a thunderstorm ripped through the Village with a vengeance. The storm was at its worst at about 10:30 and when it was over, the whole Square was littered with debris. Neighbors stepped in immediately to begin the cleanup. By noon things were mostly back to normal. Some of the big limbs downed are now stacked neatly in short lengths. Patrons of the Recreation of the Historic Emporium continue to be impressed with the substantial nature of that recreation. They felt entirely safe inside. It is unlikely that the previous permutation of the Champion Store would have fared so well, though it doubtlessly saw many a raging tempest in its time. The electricity was off and on for a while as the White River Valley crew replaced a transformer up on County Road 243. Otherwise, it was a just another busy day in the hub of the community. Friends, neighbors and family visited back in the meeting room, on the wide veranda and out on the Square–sharing their observations, memories of the past, and hopes for the future. It seems to be an annual event that the sky opens up any time Harley comes down from Illinois to make hay. That might just be a coincidence. He always brings good humor with him. Another storm on Friday brought down more trees and brush across county roads. Chainsaws hummed all over the place to open pathways to get back to the middle of things–Champion. That Friday storm ended just in time to make conditions perfect for the Vanzant Picnic. The temperature was ideal and lingering clouds kept attendees from having to compete for the shade this year. The puddles were easy to avoid. Friends who only see each other at these events reunited with much laughter. The food was superb and the music sublime. Steve Moody does a wonderful job as master of ceremonies and Pete Proctor and his fellows from the American Legion Post presented the Flag. Saturday evening also started off beautifully and the crowd was having a wonderful time when, at about 8 o’clock, the electric transformer overheated and power was lost. There were no sparks or other fireworks, just a sudden loss of juice. The band, however, played on. Big Creek was on stage when the power went out and they completed their set acoustically. Then Backyard Bluegrass took over and performed their portion of the show in the dark. The General, speaking under the condition that his limited knowledge of the situation be presented as if he knew what he was talking about, said that the bands are to be commended for carrying on, which, indeed they are. He said the fire department (Eastern Douglas County) and some picnic workers used their vehicles to light the picnic area until the electricity resumed. It was about 10:20 when the Howell Organ people arrived and quickly restored the power. By that time the crowd had thinned out to just the workers. Speculation was that the additional lights that had recently been installed combined with the electrical requirements of the picnic and the possible damage to the transformer from recent storms and the age of the device all led to its failure. The spokesman said that no squirrels were hurt during this calamity and that a larger transformer will be installed in the near future. Already plans are in the works for next year’s picnic. Meanwhile, Thursday’s pot-luck Bluegrass jam will continue in this splendid venue with all the fun that brings. Sharon Tate Williamson has a birthday on July 13th. She shares the day with great niece Sophia Zappler who lives in Austin, Texas but comes every summer to visit her old aunt and uncle in Champion. Jude Hicks is a kindergarten student at Skyline School. (Keep in mind the proposed tax levy increase of $0.49 which will appear on the ballot on the August 2nd election. It will represent a small tax increase to the residents of the Skyline R2 School District and will be the determining factor in the school being able to obtain matching funds from the State—critical to the long term survival of our small rural school, serving the community so well.) Jude’s birthday is on July 14th. As he grows up he will learn that he shares a special day with the people of France. Bastille Day, July 14, 1789, marked the beginning of the French Revolution when the infamous prison was stormed by partisans fed up with the abuses of the monarchy. A few weeks later the French National Assembly abolished feudalism and adopted the Declaration of the Rights of Man and of the Citizen as its constitution. This was inspired by the American Declaration of Independence and contained the iconic statement: “Men are born free and remain free and equal in rights.” Quotes from current presidential candidates and past Presidents of the United States include the following: “The problems we face did not come down from the heavens. They are made by bad human decisions, and good human decisions can change them.” “What is needed now, more than ever, is leadership that steers us away from fear and fosters greater confidence in the inherent goodness and ingenuity of humanity.” “We must especially beware of that small group of selfish men who would clip the wings of the American eagle in order to feather their own nests.” A recently departed Nobel Laurite and Holocaust survivor said, “We must always take sides. Neutrality helps the oppressor, never the victim. Silence encourages the tormentor, never the tormented.” Apply happy birthday wishes and profound common sense philosophies where needed. Come down to the broad banks of Auld Fox Creek for a look at a beautiful place in the world. 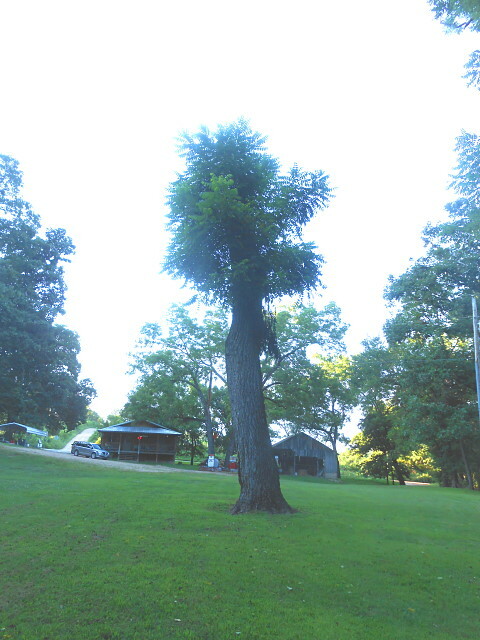 A prominent citizen pointed out that the Behemoth Bee Tree stood like 35 foot tall pop-sickle stick hardly ruffled in the breeze and the bees are fine. “The storm in its fury raged today, crushing hopes that we cherished so dear. Clouds and storms will in time pass away. The sun will shine again bright and clear” in Champion—Looking on the Bright Side! Friends gathering once a week or so ask each other, “How are you?” “What have you been up to this week?” “How are you doing?” One answers, “I must be doing OK. At least nothing bad has happened.” This is a philosophical point that proves itself regularly. The absence of something bad is indeed the same as something good. As the Wednesday bunch chatted among themselves and examined items of interest (this time an engraved silver tatting shuttle with work in progress), it was peaceful in the extreme with no unseemly behavior by anyone and no provocative angst. It was just lovely, particularly as Hoovey and Dawn Henson came for the experience. They were in town for the annual alumni doings at Mountain Grove High School. They will be back for the Champion School Reunion in September. They had already been to Tulsa where Dawn grew up and went to school. Hoovie had some artifacts of Dawn’s family going back to the time of Abraham Lincoln and it is clear that he considers himself to be lucky to be intertwined with someone of such fine pedigree. Dawn grew up in the city and has lived in cities all her life. She likes it. Whippoorwills might make her as anxious as sirens make country women. It was a good time for Hoovey to get to visit with cousins, Deward’s Granddaughter and Ethel of Omo. He had plenty of stories to tell about the generation that included Deward’s daughter. It is funny what we remember in the way of family stories. Some are poignant, some humorous, some revisionist and some are there to tie the distant past to the future for the sake of continuity and the feeling of belonging. Family. Imagine if Elmer Banks were your Grandfather! Just think about that. His grandson, Chris, was visiting from Louisiana–a good looking, well-spoken young man somewhere in his 20s with a nice smile and a polite demeanor. Years hence he will have stories to tell. He probably already has some. The storm that blew through the Starvy Creek Bluegrass Festival on Thursday evening made its way down to Vanzant before the music was over. Starvy Creek is up by Conaway, Missouri in northern Webster County–up the road a piece from Marshfield. Musicians come from all over in their RVs and camp for a few days. They bunch up and play all night, or so said Sally’s brother as he was planning to go. The internet news is that Friday dawned beautifully up there and they were all looking forward to a beautiful day. 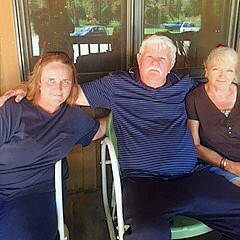 Meanwhile back at the ranch, it was lovely to see Sherry Bennet out on the east side again and David Richardson down from Norwood. He’ll be on stage next week at the Vanzant Picnic, Friday and Saturday, the 8th and 9th. Doug Bean and his wife Bonnie live around Caulfield, MO. They come out to Vanzant from time to time. Doug has a great voice of that Bluegrass timber that is called ‘high lonesome.’ He knows old songs with lots of words…fox hunting hound dog songs—always a gift when he sits in to sing. Over at Champion on Wednesday Hoovie had said that he and Dawn were planning to come to the jam Thursday, but he did not say that Royce and Jody would be there too. Royce said that he had been reading about this gathering in The Champion News for years and was glad to get the chance to see for himself. They seemed to have a good time. The rain had caused Royce to be able to take a day off from work and, hopefully, the storms had all passed before they started their long trip back to Springfield. Hooray for the folks in Kunkletown, Pennsylvania. With great community involvement and a law suit, they were able to stop the Nestle Corporation, which had its sights set on pumping 200,000 gallons of water per day from the aquifer there. Residents were worried about the impact this would have on local wells. The predatory water profiteering actions taken by Nestle’ Water Bottling Company in various cities, counties and states has yielded mega profits for Nestle at the expense of citizens and taxpayers. (Corporate welfare) During California’s historic drought, the company was siphoning off 80 million gallons a year from the Sacramento aquifer. Nestle calls itself “The Healthy Hydration Company” and has 67 different brand names for bottled water including Perrier, San Pellegrino, Nestle Pure Life, Poland Spring, and Ozarka. Company spokespeople have actually said that “water should be defined as a need—not as a human right.” As to human rights, the United States Supreme Court recently rejected Nestlé’s appeal in a child labor case in Ivory Coast. It has admitted the use of child slave labor in Thailand and Turkey and is implicated in the practice in countries around the world where chocolate is produced. “This is awful, what can I do?” If it says ‘Nestle’ on the package, do not buy it. It might alter your grocery shopping habits drastically as the company has an enormous number of products. A person says, “What difference does it make? What can I do to change the practices of this enormous company?” Perhaps the only difference will be the peace of mind that you get from not contributing to the evil. (The absence of something bad is the same as something good.) Champion sits on a beautiful aquifer. The Nation celebrates its birthday on the 4th of July. On the 5th of July the Dali Lama shares his birthday with Virginia Canada. Janet Burns and the late Walter Darrell Haden have the 6th marked as their day of remembrance. That is also the last day to register to vote in order to be able to participate in the August 2nd election that will fill several local offices and will give residents in the Skyline R2 School District the opportunity to pay a few cents more in taxes to insure the financial security of the important little institution. Of course it is to the advantage of certain entities to keep the population only educated enough to follow orders and to run the machines, but not educated enough to be capable of the critical thinking that would allow them to question. Passive people are more easily manipulated. That may be the reason that education is so expensive and so underfunded. Supporting this little school is a gift that will pay off down the line. “Reckon who is having the most fun?” That was the question under a picture of Buzz Woods and four little grand people, the tallest one being about elbow high, as they were strolling along together engaged in deep conversation. The annual Tree Huggers Jamboree at the Mill Pond is an event much anticipated and this year attended by many far flung huggers, some from as far away as Portland, Oregon. Independence Day all around the country is celebrated by gatherings of friends, old ones and new ones, celebrating with good food, music, fireworks and homages to nostalgia and patriotism. What brings us all together all over the Nation at the peak of the beautiful season is acknowledgement of good fortune. Though one Old Champion says, “Everything that doesn’t hurt, itches.” Teeter Creek herb people will be there with friends and family and will have some suggested remedies for those aches and itches and will help fill in the names of some of the wildflowers that are gracing every country lane this time of the year. Some of those Old Tree Huggers will be harkening back to an old John Prine song, “We blew up our TV, threw away our papers, Went to the country, built us a home, Had a lot of children, fed ’em on peaches” and some of them found themselves in Champion—Looking on the Bright Side!